Elijah Burgher: Four Paintings features new works the Berlin-based artist created while in residence in Los Angeles in fall 2018. 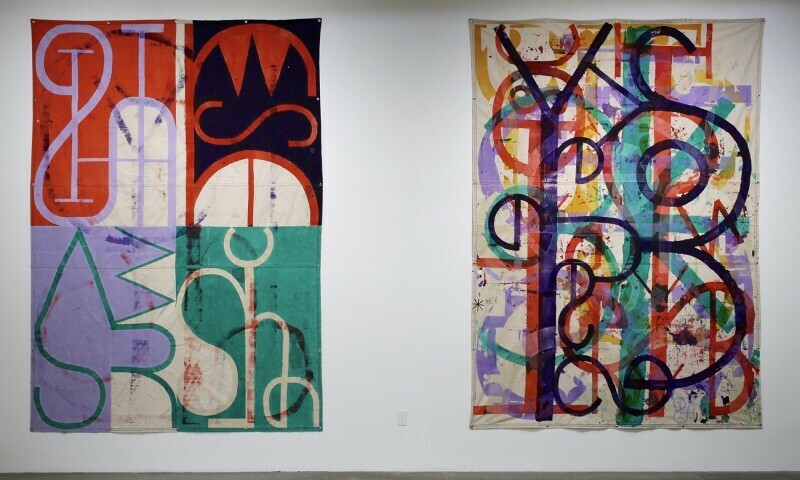 These un-stretched canvas works were created in tandem with paintings exhibited in the group show Sperm Cult—on view at LAXART from November 11, 2018 to January 6, 2019—and are similarly based on the signs and symbols of occult ritual. Conceived of as visual hexes, each painting comprises an arcane language of line and color. Exhibited among raw, modular seating structures installed in the main gallery, these works will provide counterpoint to the live actions of LAXART’s Winter Event Series, a month-long program featuring poetry, artist talks, concerts, and dance.